Searching for top talent and hearing crickets? You chronicled daily life on the job, included a few key tasks and detailed competencies in the job description. You’ve checked all the right boxes, and your job posting seems to be good to go. In a Hail Mary attempt, you’ve even sprinkled some magical fairy dust to entice the perfect candidate. But, still no purple squirrel. What’s the deal? The answer: lack of optimization! 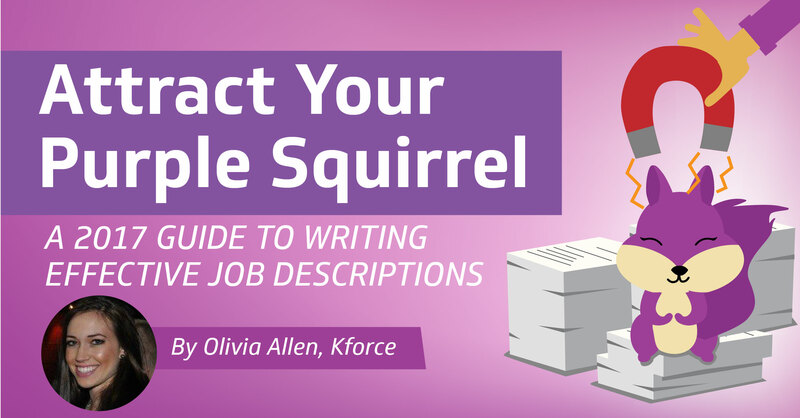 Get in front your ideal candidates – those elusive purple squirrels – by optimizing your job descriptions. The Pew Research Center states that 79% of Americans who have looked for work in the last two years have turned to the internet to seek out job information. It’s becoming increasingly more important to optimize job postings to increase views, applies and successful hires. Employers that fail to optimize their job descriptions will not attract top talent. As an employer, you know the exorbitant cost and production loss associated with a wrong hire. Backfilling an employee who quits costs an average of 21 percent of their annual pay, according to Harvard Business Review. That’s a costly mistake! Make your job descriptions stand out from the pack with the latest job posting trends and best practices below. Optimizing job titles is beneficial for SEO, allowing job descriptions to get found online easier by more candidates. The term “director of first impressions” gets up to 10 searches a month. The same position, when called “receptionist” instead gets up to 30,300 searches. Choosing the right keywords plays an integral role in developing your job postings’ SEO framework, another necessity in this digital world. Since Google holds the biggest market share in the search engine industry, it’s critical to implement SEO to ensure your job postings appear in search results. Showcase your business in the best light. Online job descriptions are a prime resource for job seekers. In fact, job boards and corporate career sites account for 35.5 percent of all jobs filled in the U.S.
Just like an interview, an online job posting is a two-way street. Job seekers are evaluating your business, just as you are assessing your potential employee. Adding company perks, benefits and other differentiators help companies stand out. Instead of using the same company boiler plate for each job description, customize this information, making it candidate focused. What is an example of an exciting initiative going on? What are some core values your company upholds? This compelling information will make candidates hit “apply!” Ensure your job post always reflects the best representation of your business. "Adobe's Global Marketing Organization is the steward for one of the world’s most recognizable and beloved brands. From visual brand expression to data-driven strategy, social media campaigns to corporate social programs, the team offers a range of exciting challenges for marketing professionals. Bring your creative and analytical skills to a company where you’ll be inspired, empowered, and rewarded for work that drives positive action." Detail what the job responsibilities require and what is expected of an employee in the role. Be sure to use clear, direct language and avoid using weak words like “sometimes,” “very,”” many,“ and ”soon.“ Be as specific as possible about the job duties, leaving room for flexibility in each task so potential candidates can see themselves in a role and understand essential job functions. Using clear, direct writing also means avoiding jargon and filler words. These words, including acronyms, often cause confusion, don’t add to the job posting and take up prime real estate. In fact, job seekers find the use of jargon to be irritating. In fact, not only do they find jargon irritating, 57 percent say it deters them from applying to jobs, per a Muse survey. To the outside person, these terms are confusing and difficult to understand without context. These words have been repeatedly used and do nothing to capture the skills and capabilities you’re looking for in a candidate. Another writing style to include: gender neutrality. In this modern climate, job descriptions should come across as gender neutral. Reach the largest audience possible by eliminating any unconscious biases that speak to only male or female populations. A study from the University of Waterloo concluded that the following words have masculine and feminine connotations. Including this language can hinder your chances of finding the right match candidate. To combat this, create a balance by using both or use gender-neutral superlatives. Be mindful of gender-bias when writing job descriptions to drive applications, from both men and women. The tool Textio is a great online tool to help ensure your job descriptions remain gender neutral. The software scans text and offers suggestions for improvement based on word choice, grammar and fluidity. Get specific about job functions to ensure qualified candidates are applying for your job, including responsibilities that are essential and unique to the job. This way, the most important duties stand out, allowing candidates to focus on those. For employers, retaining top talent can be a challenge. Forty-four percent of job seekers accepted their new job because it offered a distinct career path, according to LinkedIn’s 2017 Global Talent Trends Report. You want employees to envision themselves climbing the company ladder, not staying in the same role for years. Pay and lack of career progression are the top two reasons why an employee quits, Harvard Business Review states. If an employee doesn’t see room to grow, they will look for opportunities outside your organization. Furthermore, millennials, who are now the largest generation in the workforce, are exceptionally more choosy about the job they take on and place a high value on career growth. Let’s be frank – people want to know what they’re getting into when applying for new roles. If employers aren’t listing salary, candidates are searching Glassdoor for wage records and market averages. Deliver an exceptional user experience and don’t frustrate your visitors with inadequate information. Including a salary ensures applicants are remaining on your website, instead of searching elsewhere. Including salary details also benefits employers. It might even raise your resume submittals by 30 percent, according to Payscale! If an applicant is seeking a higher-paying job, they can automatically disqualify themselves from the position, saving you time during the hiring process. It additionally helps companies stay on budget and adhere to salary equity throughout their organization. Can candidates apply to your job using a mobile phone? If not, you’re missing out on qualified applicants. Seventy-two percent of active candidates and 62 percent of passive candidates have visited a company’s website to learn about careers via mobile phone, LinkedIn reports. Boost applications by ensuring that the website hosting your job descriptions is responsive and delivers a positive user experience. It’s no secret that video is one of the hottest marketing trends of 2017. It’s projected that all internet traffic from video will comprise 80 percent of global internet traffic by 2019. Businesses are using video as a strategic tool to communicate with their viewers easily. Use video to showcase the job, connect with your target audience and convey pertinent information. This video has a human element by featuring a Kforce representative and illustrating daily life within the role. Using video, Kforce targeted candidates by elevating their recruitment strategy to attract top talent. The times are a-changin,’ and so are the positions within your organization. Your job descriptions should be a living, breathing document that is constantly being tweaked to reflect new or changed roles at your company. Update job descriptions at least once a year, the Society for Human Resource Management suggests. As finding the right talent continues to be a top priority for organizations, so will writing effective job descriptions to attract qualified job seekers. Need help writing a job description for a new role? Use these 2017 trends to find your prized, purple squirrel!